This card indicates that you are engaging in a conflict of some nature. It can also suggest a disagreement with others, which leads to hostility and tension. Despite the fact that you think you ve won, you might still lose in the big picture, because you have annoyed or hurt those that you have argued with, and as a result, you are on the road to isolating yourself. Perhaps, at the moment, you believed that it was more important to be right rather than appreciate and understand where the other side was coming from. Right now, it's important to attempt to pick up the pieces. You still have the chance to act while the conflict is still fresh. You may feel as if everyone and everything is against you. You might also lose some friends along the way. This is why you will need to make a significant decision about your point of view. What is more important to you? Mutual progress, or winning? This might require you to stand up to a conflict within yourself. What is more important to you? Mutual progress, or winning? The card represents ambition in a way which is rather negative. Too much ambition without actual regard to the consequences or the people that you affect is never something good. Misplaced ambition such as the one depicted by this card can leave you as a dejected loser or a callous winner – in both cases, the connotation is rather negative. This card instead asks us to be more considerate of those that we surround ourselves with, to let go of ego. 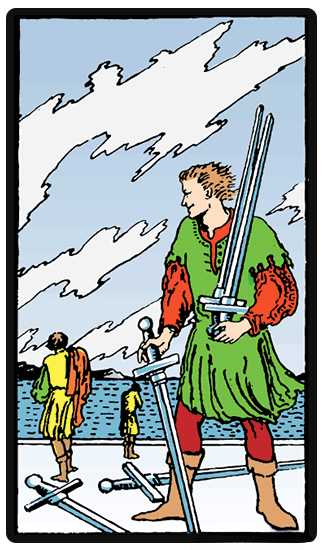 In the upright position, the Five of Swords is a card of tension, conflict, and disagreement. The Five of Swords reversal meaning shows you that all you want is for that particular period to be over so that you can forget and forgive. Because you are beginning to understand that winning is not everything, you will be capable of focusing your energy on something a lot more constructive and positive. Another interpretation of this card in reverse is that the conflict you are experiencing is actually going to become more upsetting as you realize that there can only be losers. These are terms that you need to come to grips with.